XLS-Medical Max Strength reduces calorie intake from main nutrients: carbohydrates, sugar and fat. It contains Clavitanol™, a patented natural complex which reduces the break down and absorption of these nutrients into calories. This results in reduced calorie intake which helps you to lose more weight than dieting and exercise alone. It's clinically proven. This is a 5 day trial pack. After 5 days you may experience the first benefits: reduced food cravings - particularly of sugary food, and lower calorie intake - and gentleness on your system. 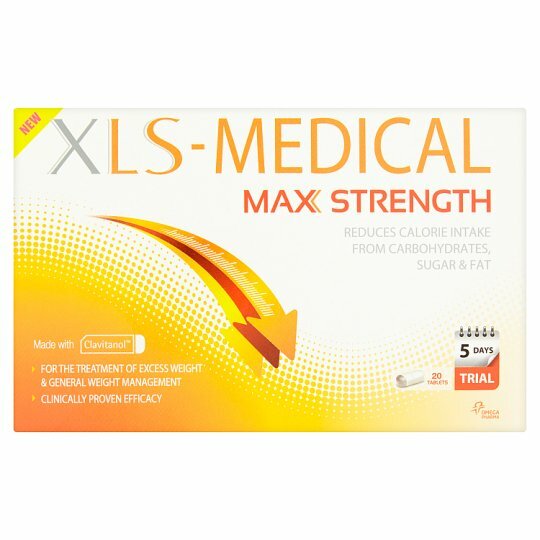 To achieve desired weight loss progress, we recommend to take XLS-Medical Max Strength for at least 1 month or more. XLS-Medical Max Strength is an excellent tool to prevent weight gain, as you can take it anytime 30 minutes before eating a calorie-rich meal. This is a 5 day trial pack. After 5 days you may experience the first benefits: reduced food cravings - particularly of sugary food, and lower calorie intake - and gentleness on your system. To achieve desired weight loss progress, we recommend to take XLS Medical Max Strength for at least 1 month or more. Precautions: Only recommended for adults over 18 years of age. The use of this product by adolescents 12-18 years old is subject to the supervision of healthcare professionals. Do not take XLS-Medical Max Strength: during pregnancy or whilst breastfeeding; or if your BMI is below 18.5. Please read the enclosed product insert before using this product. Keep out of reach and sight of children.